It took a few to get her to behave but we did. SHe is great with my granddaughter. Echoe is now 2 and 1/2 and a great protector for me and my family. Hi Kim. 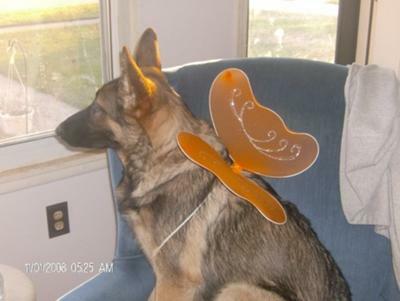 Thank you so much for taking the time to come here and share your own personal German Shepherd puppy rescue story and picture of your beautiful German Shepherd puppy Echoe with all our readers here today. What great pictures of Echoe that you have sent in too. She looks so comfortable and happy too - and I love the fairy wings she is wearing. Beautiful photo. Did you take the shot? Or did someone else take this photo for you? Either way, they are both great photos of Echoe and very sweet.